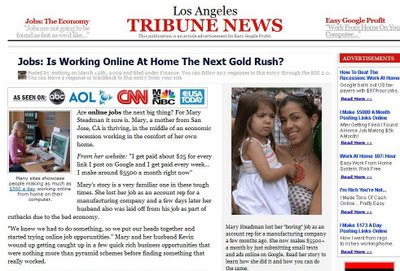 Just like the Miami Gazette News scam pitching "Easy Google Profits" Hoax... today I saw a pop up ad for the "Los Angeles Tribune News" -- claiming some stay-at-home mom made $25 for every link she added to Google, saying she makes $500 per month. It's a load of crap! Don't fall for it! The news around the web is that people pitching Easy Google Profits say you only have to pay one dollar or $1.99 or whatever, but the fine print shows you'll be allowing them to charge your credit or debit card $40 or $50 or much more per month if you sign up for it. Just like some of the people selling the acai berry products, some of the people pitching the Easy Google Profits don't feel bad about confusing people and in essence stealing their monies -- at least for now they don't.